ukmelia | What a book! I have not read any new Stephen King novels for quiet some time. He sort of lost me with Tommyknockers and from then on out I just stuck with re-reading old favorites like The Stand and Eyes of the Dragon. 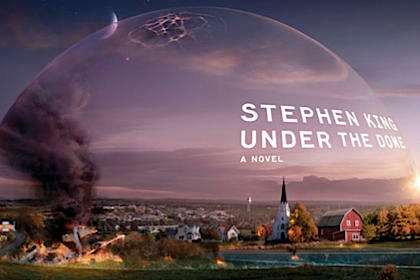 But Under the Dome caught my eye at the bookstore and the price was right and I vaguely remembered a positive tweet from author Neil Gaiman about Stephen King (at the time, I thought the tweet was about this book, but later learned it was for a newer one but by then, I was sucked into The Dome. So thanks Neil, for inadvertently getting me to read Stephen King again.) so I bought the monster-sized book and settled down to read. Under the Dome is the King I love. The one who takes his time developing characters and adding layer upon layer into a story until you are so completely absorbed that you find yourself thinking about the characters when you’re not reading. You worry about some and hope others get their come-uppance in the end. Most of all, you want to find out what the hell is up with the Dome? He keeps you guessing on it for over a thousand pages but it’s okay, because there’s an entire town full of people who will keep you turning those pages. The premise is really quite simple: What happens to a small New England town when an invisible-ish barrier is dropped onto it? What I loved most about this book is it is not a full-on horror story like It or Pet Semetary. I’m not saying I don’t appreciate it when Stephen King gets freaky with the things that can scare you like clowns and zombified relatives. But as I’ve grown older, I’ve discovered what King is really – I mean really – good at is the character study. Stories like Shawshank Redemption and Stand By Me are where he really shines. Even The Stand, which is my all-time favorite King story is more about the characters than the God/Devil thing. So from me, this book gets five out of five stars. Go find it if you haven’t already read it (it came out in 2009, so it’s not new or anything) and settle in for a good, long stay inside the Dome. 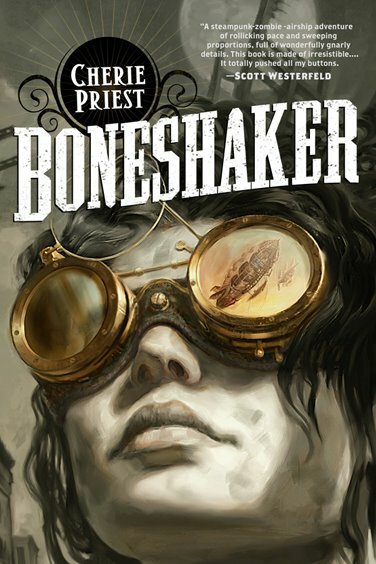 *Yes, I know he’s written much since Tommyknockers, including the Dark Tower series and other books I would probably enjoy if I gave them a shot. I was just so put off by by Tommyknockers that it took me a while to get over it. 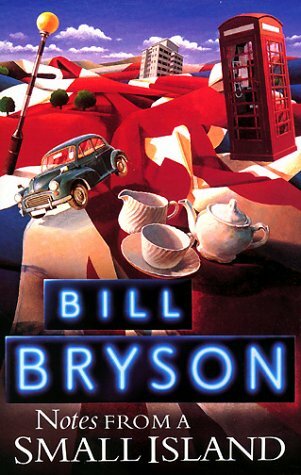 Intrepid explorer and magnificent wordsmith, Bill Bryson takes us on a journey through his home this time. That’s a little bit misleading really… I should say he takes us through the history of home life using his own pile of bricks as a sort of jumping off place. Now, I am a Bryson devotee. I have yet to read a book of his I didn’t love and cherish. But even for me, the subject matter sounded, well, a little bit dull. And this is no small tome either. 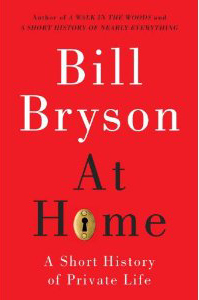 I wondered how he would go on and on about the rooms of a house for hundreds of pages and keep my interest. To me, it seemed like a bit of a risk for Bryson. I should never have doubted him. Bryson weaves history, astonishing facts (Thomas Jefferson invented the french fry. Who knew?! ), current information, and authoritative references brilliantly and with his usual gentle humour. Bryson’s old rectory in Norfolk, England forms the basis of the book as we explore his hall, kitchen, parlours, servants’ stairs, bedrooms, and even the fuse box. What fascinates me is that the chapter about the fuse box is filled with the sorts of things you just never think about or take for granted. Things like how dangerous it was to wander about after dark before electricity became widespread. How taking a midnight stroll meant you took your life in your hands and subjected yourself to thieves and murderers because the streets were so dark. Or how Britain was forced into total blackness in 1939 by order of the government for fear of the Luftwaffe. One could be fined for lighting so much as a cigarette on a street corner. It’s rich, exciting, fascinating glimpse into the past that I guarantee will make you look at your own home a bit differently when you’re through. I think it was the film ‘Shaun of the Dead’ that started to turn me around on zombies and think about them and how they function (or don’t function as the case may be.) I once wrote a short story involving zombies which turned into a book and my zombie love was sealed. 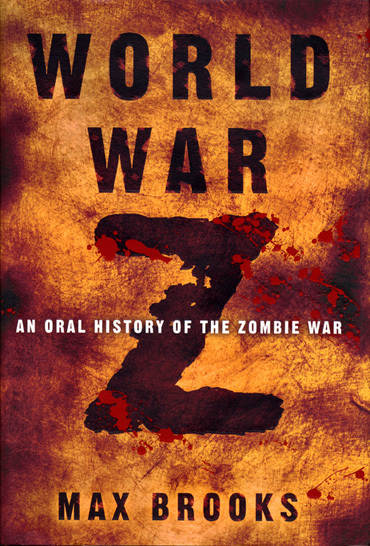 I’m pretty sure I heard about ‘World War Z‘ on Twitter. I follow some authors and other fans of zombie stuff and while I never heard much about what the book was about, I was still intrigued because, you know, zombies. After checking with my Facebook peeps, all of whom highly recommend I get this book pronto, I bought it and, excuse the pun, devoured the thing. It is perhaps the most unusual take on zombie fiction I’ve ever read. It’s written as a sort of non-fiction fiction narrative. A journalist travels the world several years after the Zombie Apocalypse interviewing survivors – doctors, military grunts, politicians, K-9 sniffer dog handlers, artists, spiritualists – to create the definitive (and only record) of those who survived the near-decimation of the entire planet. It’s haunting. Thought-provoking. Riveting. Sad. Heroic. Uplifting. And creepy as hell. Imagine being tasked by what’s left of your government to march endlessly across the plains on a sweep and clear mission. You must take on wave after wave of “Zacks” (as army grunts call them) and they never seem to end. Only a head shot will take them out and your ammo is limited. Or perhaps you are a panicked, frightened teenager in what’s left of Kyoto. In your apartment building there are nothing but infected corpses reanimating as soon as they die and heading straight for you. How do you escape? This book is a collection of tales like that and while, yes, it’s fiction, it’s written as if it really happened, without any irony or facetiousness and it will reach out, grab you and make you think about stocking up on bottled water and canned foods. YOU’LL LIKE THIS IF: You enjoy zombie stuff 🙂 Honestly, it’s one of the better zombie books I’ve read. World War Z on Wikipedia. Harry Dresden is a private eye in Chicago. He’s also a wizard. When I first heard about this book series, I was iffy on what my interest level would be. I’m really not much of a sci-fi/fantasy reader in the traditional sense. Don’t get me wrong, The Lord of the Rings books are among the books I must re-read every couple of years. But you really won’t find me haunting the sci-fi section at the bookstore much. Until the Dresden books came along, that is. 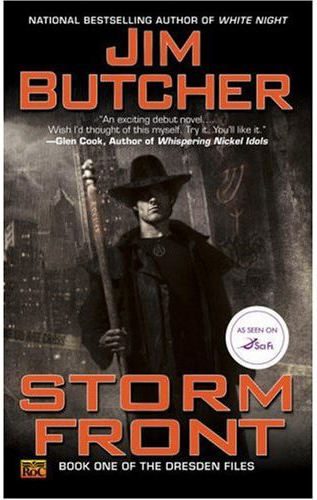 Author, Jim Butcher, uses the gritty streets of Chicago as the backdrop for fantastic tales of wizardry and faeries, of demons and vampires and were-creatures galore. His style harkens back to a sort of noir style. Conjure up an image of a P.I. sitting in his dingy office in some forgotten office building in the bowels of the Big City. He works alone, has few friends and is somewhat ornery. That’s Harry Dresden. There are currently eleven books in the series with the newest one due out this April. Check out Jim Butcher’s official website for more details. YOU’LL LIKE THIS IF: You like a good detective mystery and don’t mind a little magic thrown in. I give this entire series five out of five stars. My favorite authors are Jim Butcher, classic Stephen King, Larry McMurtry, some Michener, Cherie Priest, Warren Ellis, JK Rowling, Anne Rice before she got all weird, Bill Bryson, Charlaine Harris, Grisham, Margaret Mitchell, John Irving, Victoria Holt… Really, the list goes on and on. Favorite series include: The Dresden Files (Jim Butcher), The Sookie Stackhouse series, Clan of the Cave Bear series, Harry Potter. I’m a re-reader, bigtime. I have a large array of books that I hold on to and will go back and read through just because I find it comforting to escape into a familiar world now and then.